Some information from a little birdie present at the 120km FEI Endurance ride at Royal Windsor yesterday suggest that nothing much has changed with the UAE mindset, and riders are still firmly digging in their heels regarding cleaning up their act. On the plus side, there was no visible horse abuse. That’s to be expected given the ride was taking place in the UK and heavily scrutinized as a result of the welfare issues at the forefront of the sport after the recent flaunting of regulations in the UAE, resulting in the removal of the WEC from Dubai. Under approved current FEI rules, all riders in this class had to carry a minimum weight of 70kg, and be weighed out at the start and weighed in once dismounted after the finish. It seems that some UAE stables have little faith in their riders’ abilities to succeed on a level playing field, with yesterday’s chicanery revolving around spot the weight cloth. 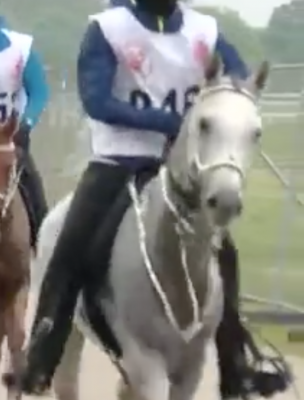 The first incident involved rider number 52, Abdullah Ghanim Al Marri who came in for 4th slot on his horse, Zulu. Flurries of activity with crew rushing to rider and horse with rugs raised some suspicion, and on investigation, a weight cloth was found lodged underneath a rug, to pass to the rider as he unsaddled before hitting the scales. Several prominent players in EGB who witnessed the ploy put in a formal complaint. This diligence was rewarded with one of the crew for number 48, Al Saaed Ahmed Jaber Al Harbi, threatening one EGB member by pushing him up against the railings at the edge of the hold area, forcing the member to put his hands up and hold his attacker away in self defence. Thanks to their vigilance, Abdullah Ghanim Al Marri weighed in light at 68.48 kg and was therefore disqualified. Because of this, the complaint wasn’t upheld, and it remains to be seen what action, if any, the FEI takes against this rider/stable and crew. Saaed Ahmed Jaber Al Harbi, number 48 (who was eliminated on gait) will be receiving a formal written warning about the aggressive behaviour of his crew member during the observation of rider number 52 weighing in. A complaint was also made about rider 31 Saaed Mohd Khalifa al Mehairi who did not follow the correct procedure at the finish (i.e. going directly to weigh in), and was suspected of being passed a weighted cloth to make up the weight to 70kg. The rider was apparently yellow-carded. Not enough, frankly. Earlier in the day, an eye witness saw the rider Ghanim Said Salim Al Owaisi on horse 61, TOM JONES TE, come round a control point corner so fast that he put the horse on the floor. So who are the parties complicit in all this? The number 52 horse, ZULO, is owned by Sheik Mohammed’s son’s F3 Stable, as is number 48, FIDEL D’ELSSANNE, as is number 61, TOM JONES TE. The number 31 horse, GHANAATI, is owned by one of Sheik Mohammed’s Stable. Over and above, it’s no surprise to read this article detailing the attempt to cover up the demise. Both these horses were also owned by Sheik Mohammed’s son’s stables. Rider number 52, Abdullah Ghanim Al Marri is no stranger to controversy. He was the rider of Ainhoa Catharissime, yet again a Fazza stable, who suffered a catastrophic injury in the 120 CEN at Al Wathba on 30/01/16. Notwithstanding the various rumours that abound of many other equine fatalities under his saddle, his sister Fatma was the rider of the swapped horse Siloah Hamza at Al Wathba in Nov 2011. Several other complaints were made regarding multi-numbered bibs and excessive crew numbers per single horse. Unfortunately the offence itself makes punishment impossible, as to penalise there needs to be identifiable perpetrators. Where is the sport in this, the sense of partnership with the horse and the achievement? Or is the point the ‘sport’ factor is nothing to do with Endurance, but how much cheating can be got away with? It looks increasingly imperative that the FEI must start dope testing all the top ten horses in every competition, as without blood tests there is no way to establish if the winning speeds are achieved naturally. Given the historical recorded cheating/doping from the Group VII countries, and on yesterday’s evidence that sportsmanship seems like a dirty word to them, what alternative is there? The results from Windsor are below.